Director (Exports) SNR Bearings, France, Philippe Chevalier, arrived in Sri Lanka recently to celebrate the 25th anniversary of Bearings and Spares (Pvt) Ltd, and meet customers. From left: Manager, Industry Division, SNR, France, Michel Peltier, Director, B and S, Dilhan Perera, Economic Counseller, Embassy of France, Jean Lonis Poli, Managing Director, Eco- Power Lanka Engineering, Dillipan Tyagarajah and Director Exports, SNR, France, Philippe Chevalier. The delegation from France was given a red-carpet welcome at the Waters Edge, Battaramulla. The chief guest was Executive Counsellor, Embassy of France in Sri Lanka and the Maldives, Jean-Louis Poli. Key personnel of leading industries were present. Directors of Bearings and Spares (Pvt) Ltd, a member of the Iceman Group of Companies, Dilhan Perera, Dushan Perera and Lalindra Silva, thanked their French counterparts for their interest in the Sri Lankan market. One of the biggest success stories of SNR, is the invention of 'Active Sensor Bearing' (ASB), designed to pick-up the speed of the wheel that is associated with the bearing. ASB is the first bearing to be introduced to the automobile industry for active speed measurement. 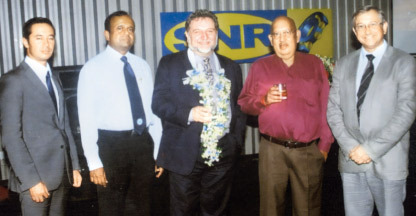 According to Director, Bearings and Spares (Pvt) Ltd, Lalindra Silva with the introduction of SNR bearings, the company will serve quality products to local customers. Bearings and Spares (Pvt) Ltd, the national distributors, offer a 24-hour service, 365 days of the year.